Messages of love, fellowship and environmental sanity. To join the TG email list...click here to email Mal and tell him where and what you'd like to be kept informed about. Heavy Earth and Lano and Woodley. 2007/8 - 9 clips including one in Austria!) $30 and CDs $25 from Andrew (free postage in Australia). - Andrew Pattison, proprietor, Troubador Wine Bar. They've played at the Skagen Folk Festival (Denmark), Nürnberg Bardentreffen (Germany), Auckland Folk Festival (NZ), Woodford Folk Festival (Qld. ), Port Fairy Folk Festival (Vic. ), Apollo Bay Music Festival (Vic. ), Donauinselfest (Austria) and the National Folk Festival in Canberra. For details of future jaunts, check the gig guide (this links to Mal's gig guide, but you may prefer to go to Penelope, Carl or Andrew's gig guide). 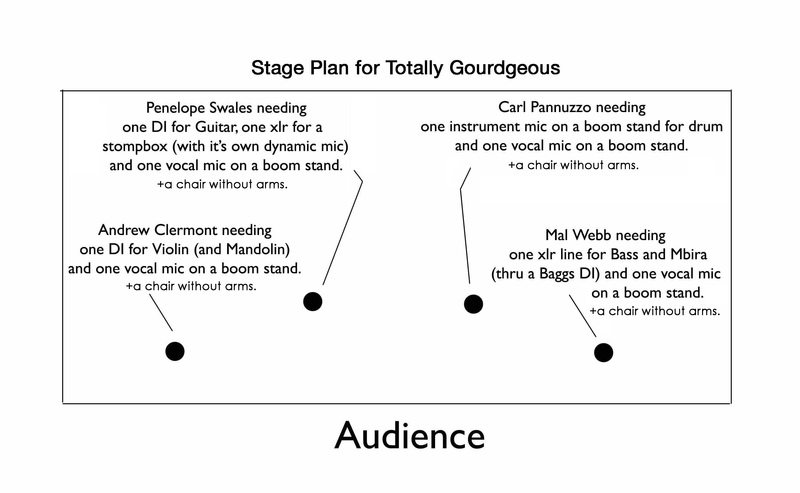 Andrew Clermont: Vocal mic and 1 XLRs (for own Multi effect DI for violin/mandolin). Penelope Swales: Vocal mic, a guitar DI and 1 XLR for Stompbox (own mic, to be EQed for strong bass end). Carl Pannuzzo: Vocal mic and 1 drum mics (like a Shure SM57) on short boom stands (if possible). Mal Webb: Vocal mic and 1 XLR (own DI for bass/mbira). We all sit on stage, so we need four chairs without arms and boom stands for the vocal mics. XLR means a mic (or "canon") cable.